Rareresource: Was Jesus lived Here Before the Dinosaurs? Was Jesus lived Here Before the Dinosaurs? Well this is going to be one of those harsh questions to answer, but I'm going to give it my best explosion. Was Jesus actually here before the dinosaurs? Let's see if we can solve this anonymity and get down to the bottom of creation. The first opportunity that we can take, is to find out when Jesus was actually born? Our best guess for Jesus' birth, would be somewhere between 0 and 5 C.E. without knowing the precise day or month that he was truly born. With that in brain, there haven't been any dinosaurs that I know of, after this time period. So obviously Jesus wasn't here before the dinosaurs, unless Jesus and God are the same entity and that both of them were created approximately the same time period. Now is when things start to get a little mystifying. If Jesus was created about the same time that God was shaped, Jesus would have been here before the dinosaurs. Maybe, or maybe not! Could the dinosaurs have actually been here before God and Jesus were born? This is the kind of stuff that goes during my mind on a daily basis and there is nobody that can really clear the fog out of the room, by answering these questions whether lucid answer. Here's the one obsession that I do know for a fact, I don't really know if Jesus was here before the dinosaurs or after, because I really don't have any evidence that Jesus was ever born or lived. At the same time, I truly don't know for a fact, that dinosaurs existed. By reading books like the Bible and history books, I can tell you that scientists have found bone structures that could easily hold theories that dinosaurs roamed the earth, but I have very little evidence to sustain the claims made in the Bible about the life of Jesus of Nazareth. You have numerous eyewitness accounts of the existance of Jesus Christ. There is much evidence for his historical existance, and more evidence for his resurrection from the dead than for any other event of history! 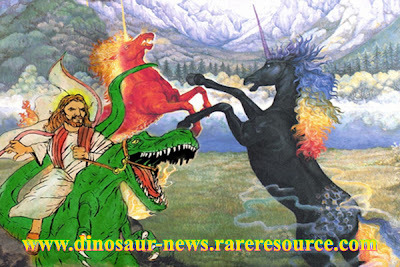 Where can I get that poster if Jesus riding a Dino?